This great Deathwing banner comes from Wienas. He emailed me the other day to ask about fixing a small problem he's having. 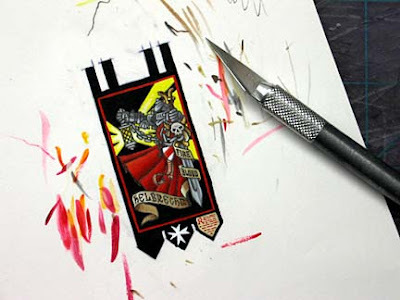 Here's my tutorial he followed: Cardstock banners. If you look close enough, you can see the raised edge where the image was added to the larger banner shape. While it doesn't stand out too bad, it's just enough to cause problems and if you're going through this much trouble, you want to make sure it comes out the way you want. First, his banner... unfortunately, there's not too much that can be done. The one solution I would try is adding some linework where the raised edge is in order to camouflage it. For future banners, here's what I would do to prevent the raised edge from standing out as much. If you look at the Black Templar banner above, you'll see a red line around the "image." This painted line goes over the raised edge where the paper image is glued to the banner shape and makes the feature a little less obvious. To do this means you have to plan to include your image in one solid box from the start. But the problem is made worse when you dont have a "box" to put your image in or you are doing more of a vignette type image. 1. Make the paper the image is on large enough to cover the whole banner so you don't have the raised edge. Just make sure to glue the paper image to the banner really well, you don't want it peeling apart later on. 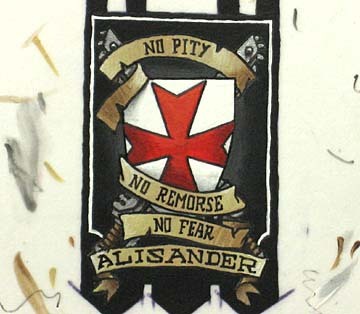 In the example below, the painted black line hides the raised edge along the top and sides, along the bottom of the banner though, the image paper extends all the way down. 2. Or you can cut the paper image out along the edge of the actual image. This can take a little more time depending on the detail you have to cut around. I did that on the example below. On the sides and top, I follow the white line (it's painted on to hide the raised edge) and along the bottom, I follow the hilts of the chainswords and the actual flowing scrollwork itself. I hope this helps some, and maybe this will get you thinking about some more detailed images to add to your banners. Hey Ron, I don't know how I missed the original post, but I've been using the same technique for a few years now. I have to say in my mind it's the fastest and easiest way to get detailed banners. I've never sealed it in the middle though, only at the end, that's something I'll have to try next time around. No problem guys,I never actually thought about adding these few extra notes until the other day when it was brought to my attention. I wish I had done it earlier, it might have saved some heartburn for a few people. You can definitely make banners with the best of them. Personally I dread any and all free hand work. I try to put it off as long as I can. oni: Freehand is easier than you think, there's no reason to dread it my friend. This is such a nice info about to the Card stock banners.Your blog provide to the customers a lot of verities of different cards. A banner is a flag or other piece of cloth bearing a symbol, logo, slogan or other message. Those are really awesome. Boys would definitely get crazy with those banners. It's really cool that you can now find these online. This post is great,so nice of you to get into prouble and help us all!What can you think about textures for the banner though?I saw the banner for youre reaver titan and it seemes like you can see the knots of the wool! 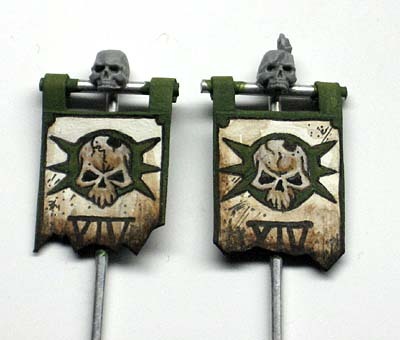 Anon: In cases where you want to add the "texture" of the banner on there, it's a matter of actually being a bit sloppy in your painting. It needs to be controlled, but the trick is to let your brush strokes show in some places. A short series of parallel lines will give the illusion that the light is hitting the material itself on the banner. Similar to the way we all paint battle damage. You're adding it on there even though it's not really damaged.